I have studied the community of a street because it isn’t a community. I studied a street because it represents no person and no group, or at least none in particular … I didn’t want some sink council estate that stood for poverty, or some mansions that stood for wealth. I didn’t want a black area or a white area. I wanted a “whatever” area … we live the discourse of the street, the fantasy of community, of neighbourhood, of history, of local identity, of street festivals, street complaints, street parking … Soon after we began a major crime occurred at one end of the street, one that involved a celebrity and reached the newspapers. Yet it never travelled as gossip to the other end of the street. Some community! 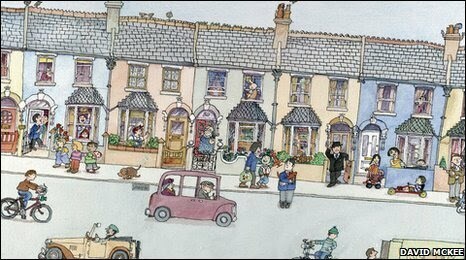 We all want to live on Festive Road with Mr Benn, but we can't go home again. Sue Bourne's documentary My Street covered similar material and was fascinating and pretty sad at times. I imagine you've seen it but, if you haven't, I recommend it. "Hey, computer age--who needs a house when you've got a homepage?" -Datarock. Thank you both for these refs.